Inhumanoids! Inhumanoids! The evil that lies within….I loved this cartoon as a kid. Dark themes, and innovative storyline. One of the best and most underappreciated toy lines of the 1980s. The three big monsters are all top notch! something almost lovecraftian about them, isn't there? this is one vintage toyline i could embrace coming back in a huge way. screw t-cats, i want INHUMANOIDS! 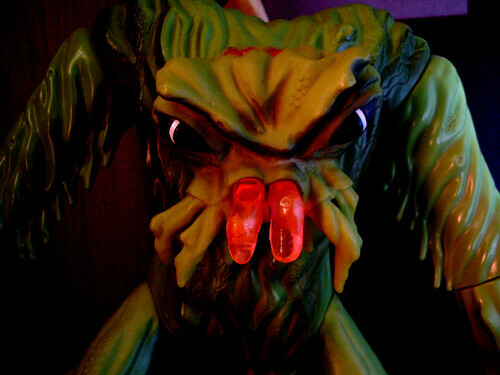 As a kid, I was mildly annoyed by the light up front teeth/tendrils in the big monsters. And more annoyed that D'Compose looked a lot less cool in toy form than he did on the show. My personal favorite was Magnokor, but that's because he's the only one I actually owned. I always did wish I had a Tendril, though. I got none of the big three guys,always wanted a Tendril and the rock people,Metlar looked too demonic(but mongor from thundercats was even more scary) and D'compose looked like crap as atoy.The humans were awesome like joe heads on body armor,all I was able to get was Magnokor and Liquidator.Most of my friends liked Visionaries better tho. One of my favorite toylines ever. Tendril remains one of my favorite toys of all time. I still have my Inhumanoids and I love them as much now as I did back then. I'd love to have some updated figures from it. I picked up a Magnokor for $2 from a local comic shop this summer. They still have the four humans for the same price, but they don't have any helmets. Great toyline, don't believe the toys were released in the UK, I would have loved a Tendrill. Wish we had got more Inhumanoids and Centurions here….well at least we got a nice dvd set of the complete series, its really good, I think there is only about 2 weak episodes all the rest are very good. Decompse was a lot cooler in the cartoon than the toy. I didn't know why they dropped the ball on D'compose's sculpt,Metlar and everyone else were perfect.D'compose had a dinosaur head but the toy seemed to have a vulture/bird head skull and spindly limbs that seem fragile and the crap cavity cage gimmick on his chest. I'd like to see an Unhumnoids movie or a new Centurions line….now there is a cartoon that time hasn't been kind to it is sooo dated and bad when I look back on it. Back to Inhumanoids, what was up with the odd proportions of the human figures.